At last year’s COP23 climate talks in Bonn, Germany, 20 countries agreed to phase out coal by 2030. Although not legally binding, the move was welcomed as part of the global drive to replace fossil fuels with cleaner energy sources. However, this group didn’t include any of the world’s biggest coal producers: China, India, the United States, Australia, Indonesia, Russia, South Africa and Germany. Worldwide 40% of electricity generated still comes from coal, and in 2016 over 7,200 million metric tonnes (MT) of it was produced globally. To put that into perspective, just over 3,000 MT was produced in 1973. 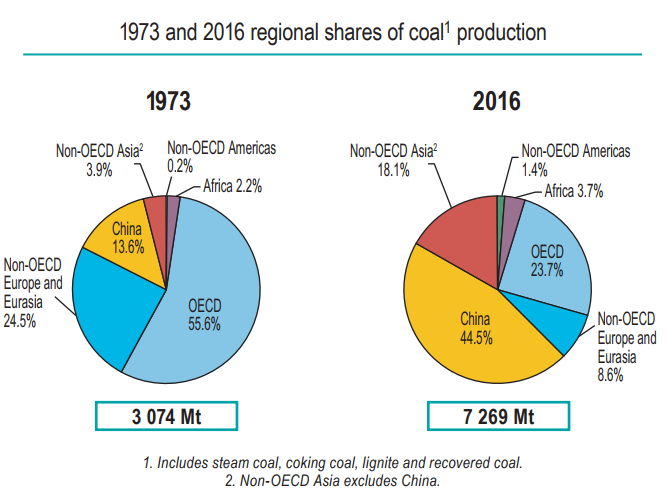 This surge in production – which includes steam coal, coking coal, lignite and recovered coal – was due largely to China increasing its global share from 13.6% in the early 1970s to 44.5% in 2016, as the graph below shows. As a result, China produced 3,242 MT of coal in 2016, dwarfing the world’s second biggest producing nation, India, which accounted for 9.7%, or 708 MT, of the world’s total in 2016. In 2015 coal accounted for half of global emissions, compared to just over a third in 1973. This is according to the latest Key World Energy Statistics report by the International Energy Agency (IEA), which provides data for the 10 largest coal-producing nations, including third-placed US, which produced 9.2%, or 672 MT, and Australia, which produced 6.9%, or 503 MT in 2016. Indonesia, meanwhile, produced 6.3%, or 460 MT, of the world’s coal last year, while sixth-placed Russia produced 5%, or 365 MT. However, such is China’s appetite for coal, it also imported 247 MT last year, which was similar to the amount produced by South Africa (257 MT), the world’s seventh largest coal-producing nation, the report shows. China’s thirst for coal also far outstrips the amount produced by Germany (176 MT), Poland (131MT), or tenth-placed Kazakhstan, which produced 98 MT (1.3%) in 2016. 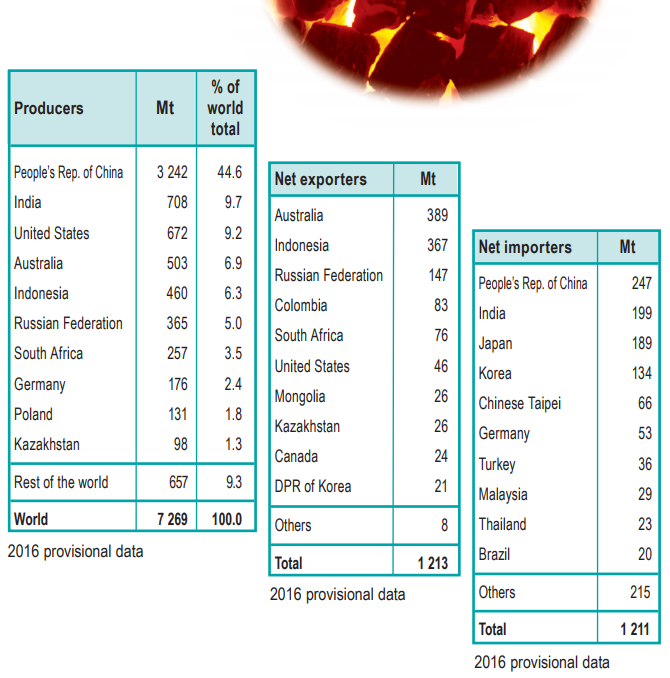 As a comparison, the IEA also includes statistics for the rest of the world, which accounted for less than 10%, or 657 MT, of all coal produced last year. Unsurprisingly, this global reliance on coal is also reflected in the increase in emissions between 1973 and 2015. 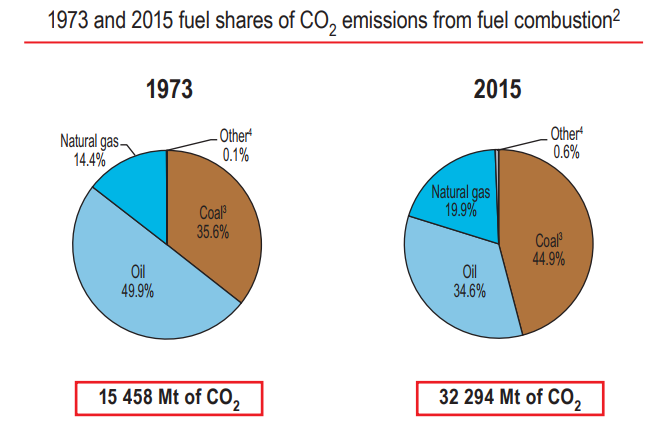 According to the IEA, in 1973, 35.6% of the world’s carbon dioxide emissions were caused by burning coal, whereas virtually half (49.9%) were caused by oil combustion. The remaining emissions were caused by natural gas, industrial waste, and non-renewable municipal waste. By 2015, however, coal accounted for 44.9% of emissions, while oil had dropped to 34.6%. Natural gas and other fuels increased to 20.5%, collectively. The 35 member nations that comprise the Organization for Economic Co-operation and Development (OECD) were the single biggest culprit, but China is catching up fast. 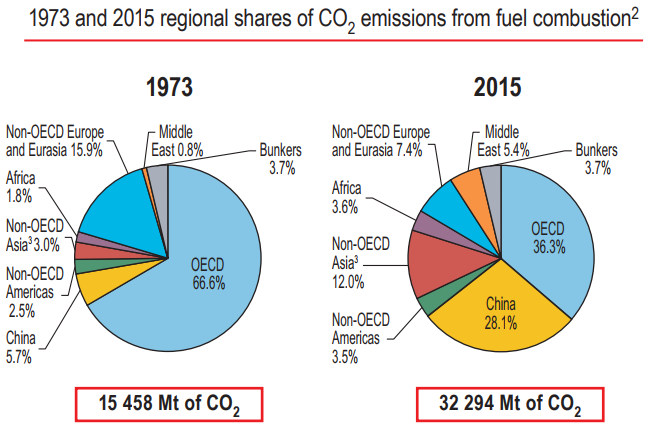 Its share of the emissions mix jumped from 5.7% in 1973 to 28.1% two years ago, the data shows. Despite this gloomy outlook, though, China is attempting to tackle the issue, having announced last year that it would invest $360 billion in renewable energy by 2020 and scrap plans to build 85 coal-fired plants. Various news outlets, including China’s official press agency Xinhua News Agency, also reported last year that a province in the north west of the country ran on renewable energy for seven days. According to the reports, the Qinghai Province only used power generated by wind, solar and hydro sources for a week in June. The energy used during this period equated to 535,000 tonnes of coal, Xinhua News Agency says. China’s ‘cleaner’ credentials are also backed up by IEA data that show it generated almost 1,400 terawatt hours (TWh) of electricity from renewable sources in 2015. In comparison, the US – the second biggest producer of electricity from renewables – generated 568 TWh, while Brazil, the third largest, produced 430 TWh. 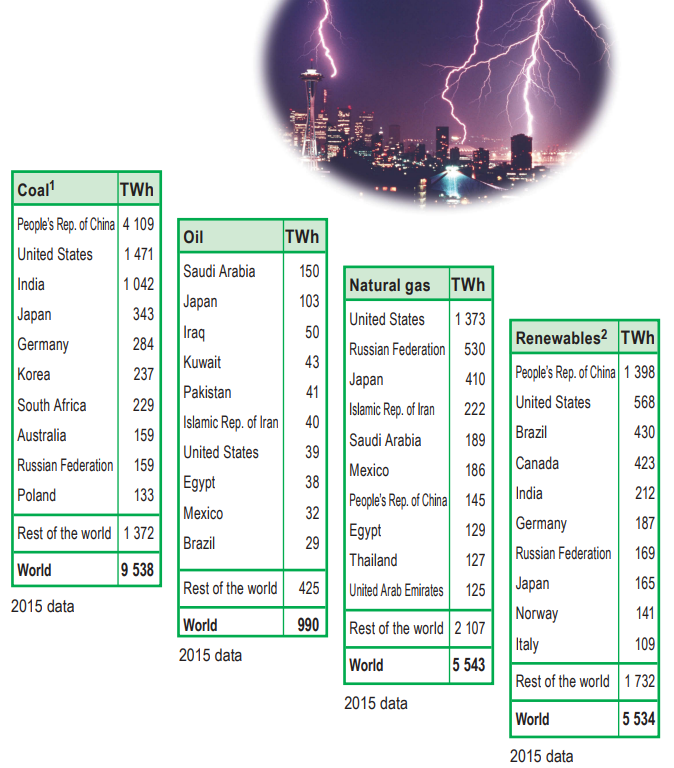 Globally, 5,534 TWh of electricity was generated from renewables in 2015, as represented in the graph below. China also launched in December what will become the world’s largest carbon market as part of its efforts to hit the goals of the Paris climate agreement and tackle its air pollution crisis.